Joining a pilates class is about making time each week for mindful movement to relax and keep your spine healthy! Group classes run approximately in tandem with school term. Numbers capped so you get personal attention. You use bodyweight and props (flexbands, small balls, hand weights, foam rollers, stability cushions, etc.) to get a great pilates workout. Booking now for ‘Spring into Summer’ term! Cost: €80 for 6 weeks OR €50 for 4 weeks. Some classes full already, call for info on availability. 9.45am: essential: working at levels one + two, move your spine in all planes of movement, mobilise your shoulder and hip joints; build core strength, flexibility and endurance; NOTE: level two stamina and balance challenges optional. 11am: gentle class: back care, suitable for over-55s too. IMPORTANT: Group classes are NOT suitable for those with acute injuries or serious back problems. If you have had a back problem, one-on-one attention is needed. If post-surgery or injured, you are advised to come privately. If you are a complete beginner, taking a few private lessons is advisable before joining a group mat class that has been running for some time. Always seek clearance from your doctor if suffering from any acute back problem before starting exercise. Bear in mind that even if you are very fit, you need to understand the basics and be able to apply the principles of pilates before you move on to the increased balance and co-ordination challenges of the level two or intermediate classes – otherwise you may as well go to a general fitness class. There are always modifications to work to your ability – whether that is a) doing more reps or lengthening your levers to make an exercise harder OR b) doing fewer reps or paring a move right back to its essence. Absolutely! Pilates was invented by a man (see here). The benefits of Pilates – flexibility, balance and strength – apply equally to men and women. If you need more convincing, read this or this. A pilates mat is thicker than a yoga mat to provide more cushioning for your spine and knees during floor work. Two yoga mats together work very well, nice ones available here. 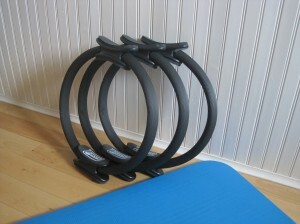 A top-quality 15mm pilates mat is available online here for €54.99. Locally, Lidl or TK Maxx often stock reasonably priced mats, but make sure it is at least 10mm thick and not too stretchy or slippy. As we get older, our flexibility decreases, but Pilates makes it possible to achieve even greater flexibility and fluidity of motion in your 50s and 60s than you had in your 20s and 30s. My classes suit all ages from 17 to 70+, as long as you have mobility for mat work at floor level OR no acute injury. Choose a class that suits your body; modifications and progressions are offered as appropriate. Classes typically begin with breathing work to focus and prepare. You will then be guided through a series of toning exercises on your mat – maybe lying on your back, front, side or on all fours. You may work from sitting or standing. I may offer you small equipment – such as pilates soft balls, foam rollers, resistance bands, fitness circles – to assist you or to introduce variety or added challenge. Everyone works to his or her own ability – remember no-one is judging you. You are encouraged to listen to your own body. Focus on yourself and not whether the person beside you can move his or her leg higher than yours. It is non-competitive! Classes start on time. Clothing worn should allow freedom of movement e.g. leggings or track suit bottoms and t-shirt. No special shoes are required as pilates is done with bare feet or socks. If you have more questions check out FAQ, either call 086 8184218 or email me at pilateswitheimear@gmail.com.